It's a coverpalooza here today! But I couldn't hold back with these two. They've been bumping around the nets for a little while now but only in small-ish versions and I was waiting for the nice big ones to highlight. You see, they're kind of heavy hitters for me. And for the past couple of years they've been consistently sending my little heart into pitterpats of joy by both releasing books in the fall. 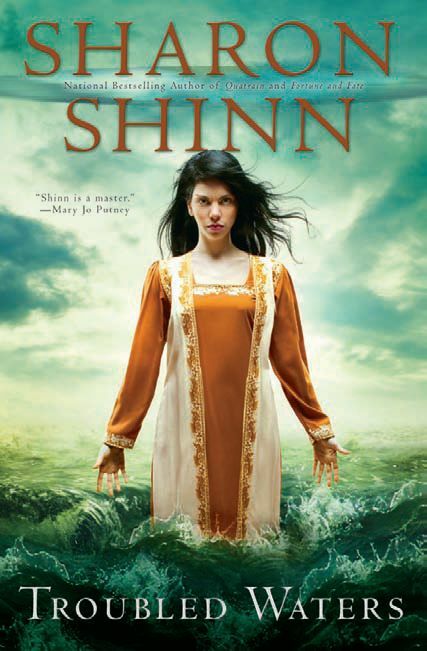 As Felix fully regains his memory, Sibeal has a runic divination showing her that Felix must go on a perilous mission — and that she will join him. The rough waters and the sea creatures they will face are no match for Sibeal’s own inner turmoil. She must choose between the two things that tug at her soul — her spirituality and a chance at love. . . Even cooler, check out that cover blurb. Yup. That's a Book Smuggler quote. Way to go, Thea!!! 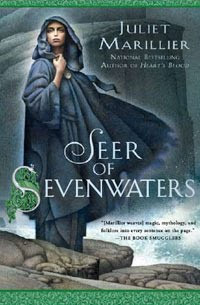 Seer of Sevenwaters is due out December 7th. I can't wait to meet Zoe and watch her come into her powers. Troubled Waters is due out October 5th. Thanks for these reading leads and the many others you supply. I don't follow all of them, but there are more than enough to keep me intrigued and at least checking out fantasy authors new to me. I love that Shinn blurb. And the first in a new series? Even better. Bish, it's my pleasure. I'm happy you've found some that work. What have been your favorite fantasy reads? Sullivan, it does, doesn't it? She's particularly good, I think, on the creation of worlds level. Always coming up with interesting and fresh things. bookaholic, lol, I think so. Li, I know. I'm getting the good vibe as well. Can't wait! Karen, I honestly can't wait to hear what you think of those two. Both so different (and very different tones) but both so great. I am SO excited!! I've loved Marillier's novels for a long time, but Shinn is in my top 10 authors!! These are two books that I'll probably be preordering because I KNOW that I'll love them!! I'm fairly new to the fantasy field, coming from years of reading/writing in the mystery field. I'm not too hooked into the urban fantasy genre, but I'm trying different series because I am intrigued by much of it. I really like some of the young adult stuff, particularly Tamara Pierce, John Flanagan, and Cinda Williams Chima. As for harder fantasy, I don't think you can beat David Gemmell or Dave Duncan. Sara, total pre-orders. I agree! Isn't Shinn awesome? Which are your favorites? Bish, a Tamora Pierce fan! That makes me happy. I have one of Cinda Williams' Chima's books on my TBR right now and I keep meaning to bump it up. Glad to hear you recommend her.